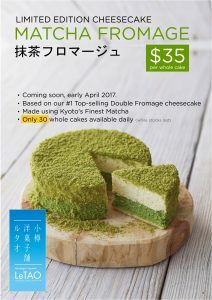 Available April 1st – LeTAO’s Matcha Fromage cheesecake! Usher in the season of Spring with LeTAO’s aromatic Matcha Fromage cheesecake (Thé Vert Double). The famed Matcha Fromage cheesecake (Thé Vert Double) is made with Hokkaido Cream cheese, Italian Mascarpone and flavourful Matcha from Kyoto. Visit our little paradise of palatable pastries at B1-K7 ION Orchard and get your Matcha Fromage Cheesecake for only S$35. Only 30 whole cakes available daily for this seasonal special!